Cultivar offer a practical and stylish shading solution for the entire range of greenhouses. 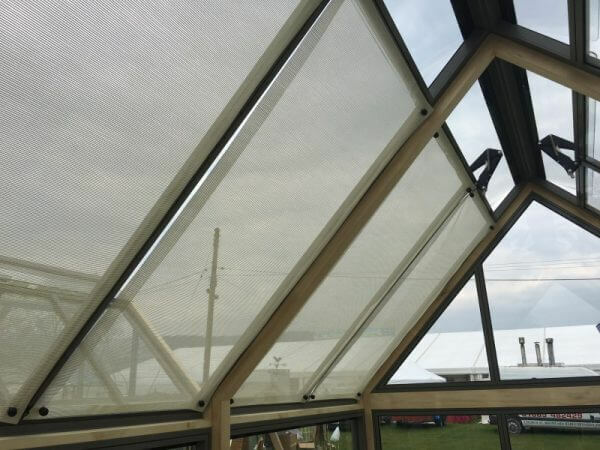 Made from a synthetic polyester scrim which is both hardwearing and resistant to moisture they offer 55% shade and are easily fitted using a ball tie at each corner that is secured to the greenhouse framework. The light colour of the fabric helps to reflect the heat in the warm summer months. These are approximately 750mm wide and a four panel long modern cultivar greenhouse will require four greenhouse shades. We will work out which size you require according to your greenhouse width.